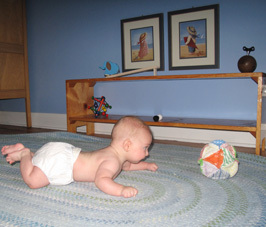 Place interesting objects on the movement mat just out of reach of your baby. Objects that he can grasp easily with his hand and knitted or cloth balls that roll slowly are best rather than hard balls that he can't get hold of and will run away quickly as soon as he touches them. Place the objects just out of his reach so he is enticed to stretch, slither, creep, and crawl towards them. When the object gets too far out of your baby's reach you can move it closer to him. 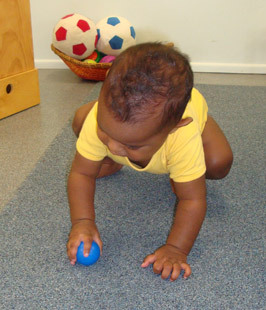 This will help him to practise slithering and creeping until eventually he starts to roll from tummy to back and then from back to tummy as he strives to reach and grasp an object. Let him struggle a little to reach the objects. Don't be tempted to stop him making an effort by putting the object into his hand. It is he who needs to make the effort not you.